I am a little late to the ball with this recipe. I had planned to post it before the holidays. I seem to always be chasing time, but even more so this holiday season. I just can’t seem to catch up. Still, this is a fun recipe to play with and maybe even more so during the quieter times of the year. Young and old everyone seems to love these sweet treats. 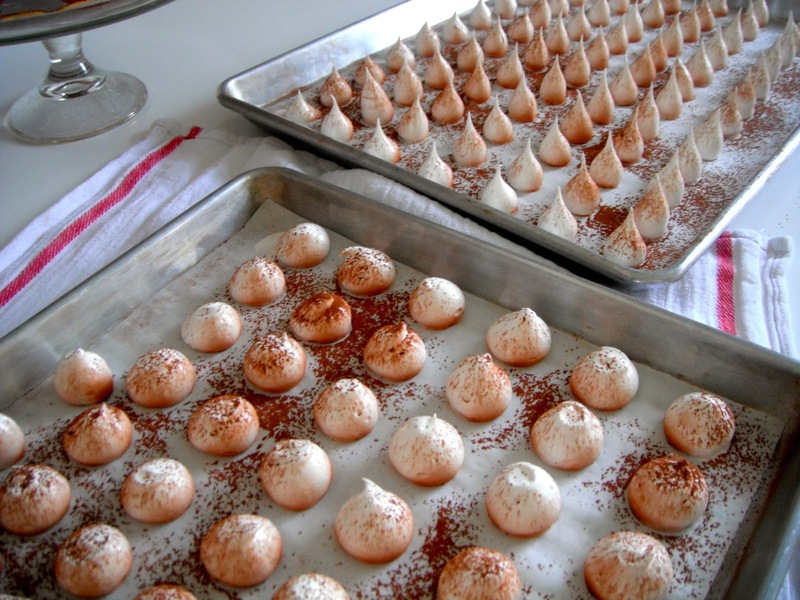 When I worked for the bakery in Palo Alto in the early 1990s, Alice Medrich, the chocolate dessert guru, opened a dessert boutique at Stanford Shopping Center. While we had fabulous products at our bakery, we were in awe of the chocolate cakes and truffles at her pretty, little boutique. They were understated and elegant, but more importantly, they were a chocolate explosion in the mouth. We were even more thrilled when Alice published her first cookbook, Cocolat Extraordinary Chocolate Desserts. The owner of our bakery secured advanced, signed, copies for us. I read that cookbook from cover to cover, more than once. It was brimming with useful information and all her wonderful recipes for her elegant desserts. 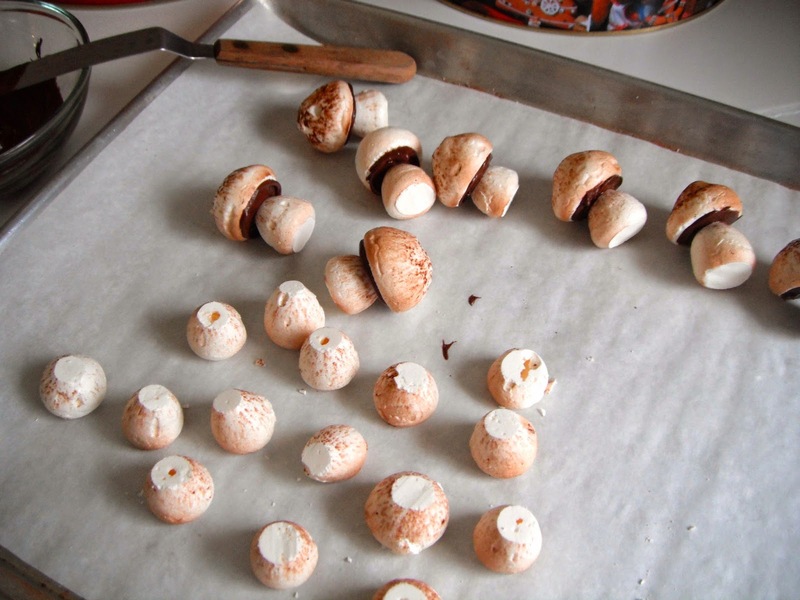 Over the years I have made just about everything in her book, but one of my favorites is her recipe for meringue mushrooms. 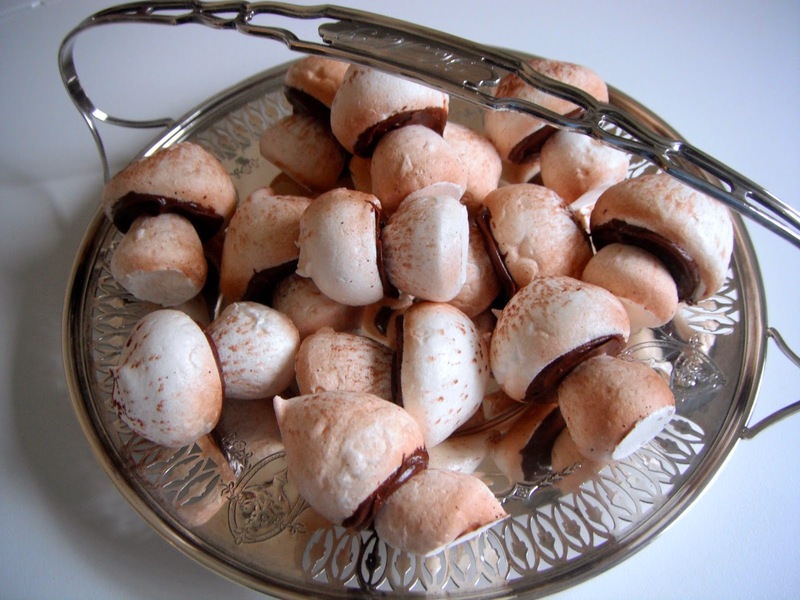 Troupe l’oeil, they are a whimsical addition to a cookie plate or a yule log. 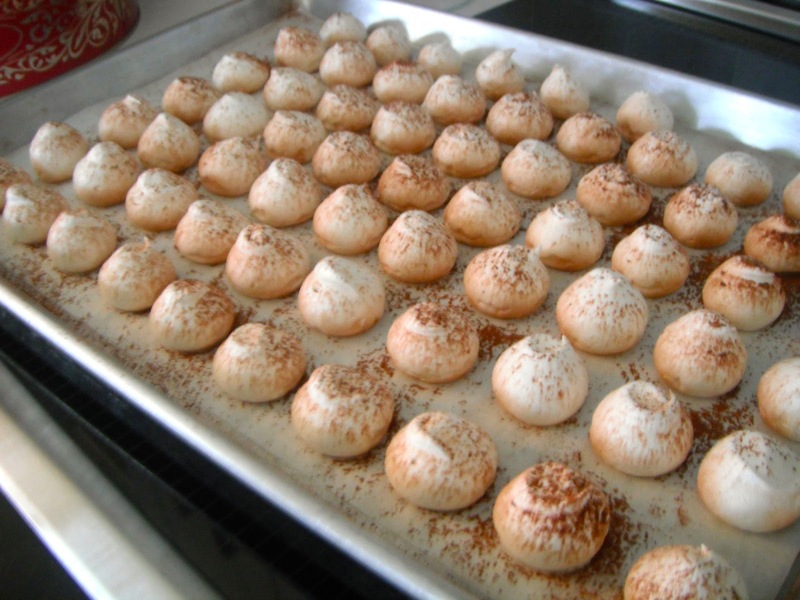 But, they are also great when you need a sugar burst in the afternoon. My children love to help make them. They are a good way to practice piping skills. If you enjoy chocolate and baking, I highly recommend Alice Medrich’s book. It is one of my all-time favorite cookbooks. Preheat oven to 200℉ (93℃). 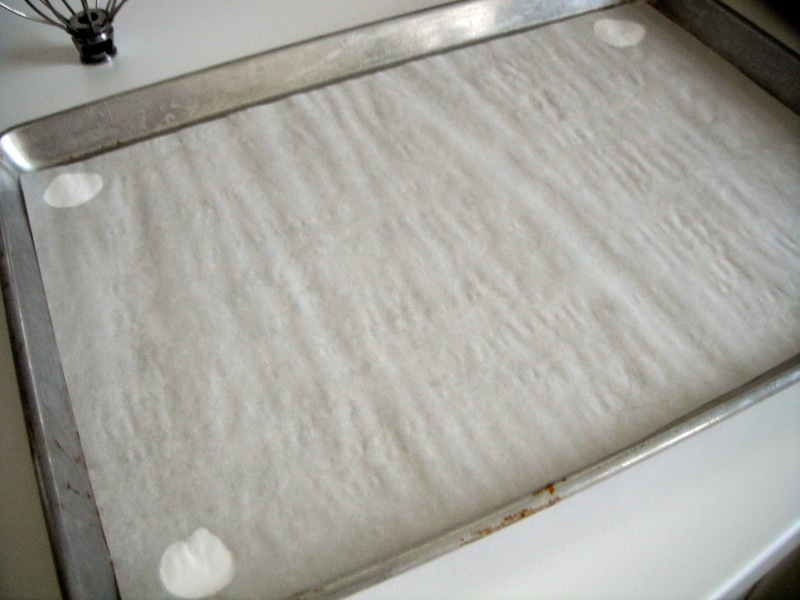 Line two cookies sheets with parchment paper and set aside. 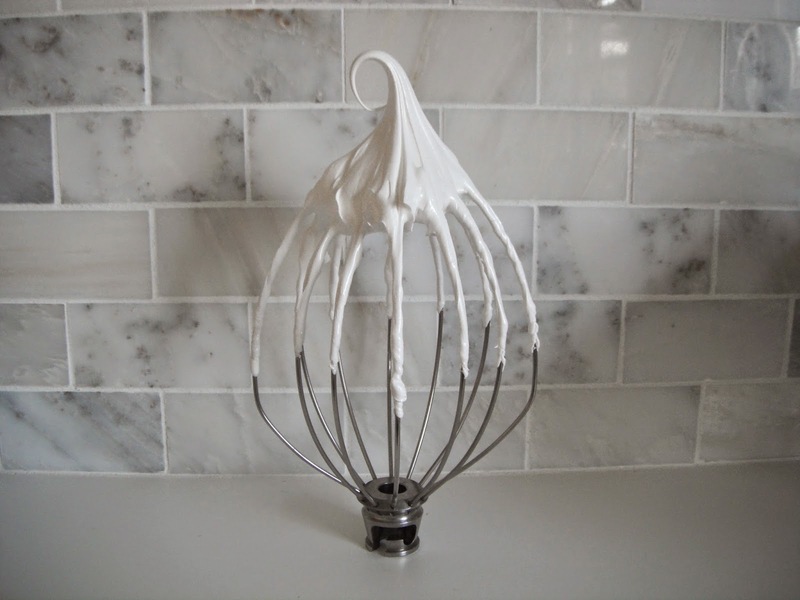 Beat the egg whites and cream of tarter or salt on medium speed in the bowl of a standing mixer with a whisk attachment until soft peaks form. Gradually add the sugar. Beat on high speed until very stiff about 5-8 minutes. 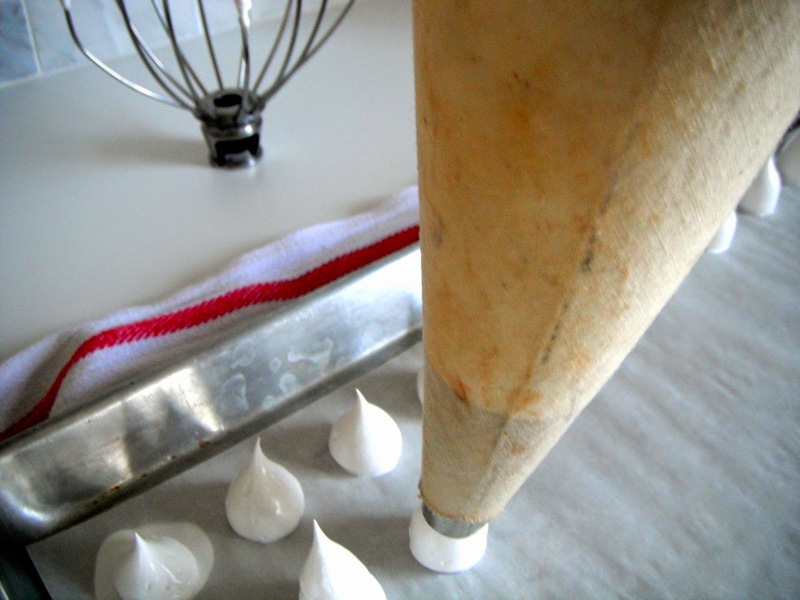 Put mixture in a pastry bag fitted with a plain 1/2 inch (1.27 cm) tip. Pipe a tray of stems and then a tray of caps. I like to vary the size a bit to give some variety. Put cocoa in a fine strainer and dust the caps and stems. 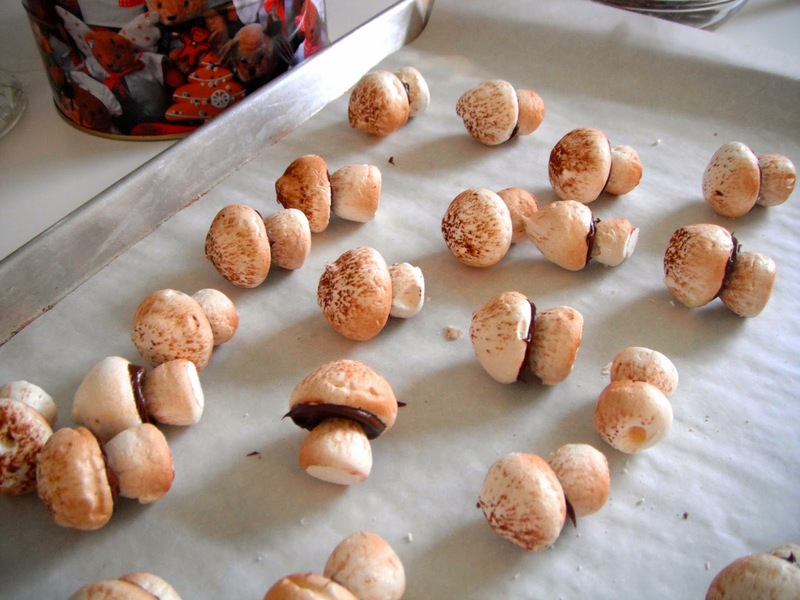 Fan or blow the cocoa to give a more realistic look to the mushrooms. Melt the chocolate in a small bowl over simmering water or in a microwave on 50% power. Trim the point off the stems with a sharp knife. Using a small offset spatula spread a little melted chocolate on the flat part of a cap and attach a stem. Allow to set up before storing in a tin. 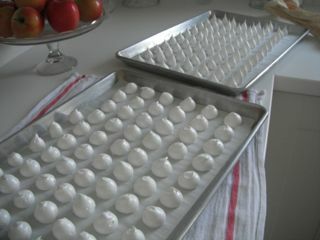 Use a little meringue as glue to keep the parchment paper in place. 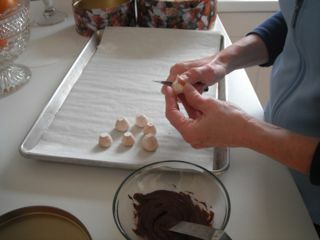 Pipe the stems first while the meringue is the most stiff, so they maintain their shape. Don't worry if they aren't perfectly shaped. They look more authentic that way. Fan or blow the cocoa to blur it. It will make the mushrooms look more realistic. The baked meringues should be dry and crisp and will remove easily from the parchment. Use a small, sharp knife to trim the point off of the stems. Join the caps and stems with melted chocolate. Store mushrooms in a tin.